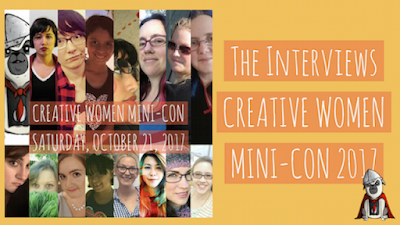 Creative Women Mini-Con returns for its 5th year -- and this could be our best year yet. 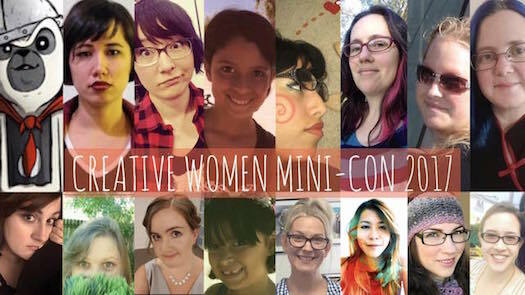 We've assembled thirteen of the region's most talented creative women. And we're throwing a sale in celebration (details below). Click here to add the event to your FB calendar. Members: check your email for October's benefit so that you can level up your sale discounts! When you support an artist by making a purchase at their table, they keep all their earning. Pay the artist directly, not the store at the counter. Art purchased from the Art Gallery wall should be purchased from the store counter, not the artist's table. The event starts at 11 am and goes until 4 pm. Need food? Visit one of the restaurants in the shopping center and bring it back to the shop if you'd like. Feel free to sit at the couches to take abreak. Take a moment to enjoy the interviews we did with each exhibitor. 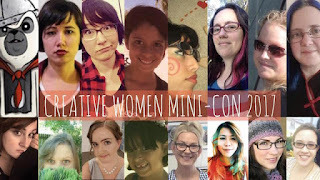 Also, below you'll find a little about each creative woman, a link to their most recent interview, and links to some of their online profiles. Angela Davis: Angela sold her first commissioned painting at fifteen. She's done commissioned pieces for the Deftones' Chi Cheng. She's also collaborated on a coloring book for the city of Sacramento. Bianca Kim: Bianca creates embroidered fabric pinback buttons with short sayings that can be worn on backpacks, purses and jacket collars. She shows at the Stockmarket craft fair in Stockton, CA. She started 2017 by showing her work in Empire's Comic Vault's art gallery in January and then offered a beginner course for embroidery in her booth at the Stockmarket craft fair in Stockton. Felicia Ann: Felicia is an illustrator and digital painter from Oakland, CA. Of Chinese-Malaysian descent, she blends her rich Southeast-Asian heritage with her enthusiasm for modern science and astronomy. Her art is expressed in the female form, with ethereal portraits that connote her personal exploration of femininity. Hannah Moore: Hannah has always been crafty and enjoyed small objects. She keeps things cute for Ghost Thunder. The animal kingdom, cartoons, comics, and video games are constant inspirations. Heather Merrifield: Heather's focus is to capture moments that might otherwise not be captured, be it in action shots, everyday moments, or the strange and unusual. She will show at an upcoming exhibit at the Crocker Art Museum in Sacramento. Jen Monson: Jen is constantly delighted by new ideas. She uses trial and error to explore new approaches to her art. Her ultimate goal is to help others feel a sense of peace and joy. A smile on someone's face is the ultimate final touch. Kassandra Gamez: Kassandra is a comics creating artist. She's worked at some cool companies, but maybe not in the art department, for example, dA and Disney Interactive. Kassandra is a huge fan of comics, zines, and Corgis. This will be her first time exhibiting at CWMC. Kelly Van Gaasbeck: Kelly's focus is storytelling and whimsical thoughts. She works mostly with ink, metallic and monoprints. She spent 2 years in Japan, teaching and learning and wandering across the country, where she came to love telling stories in small spaces. Kristine Balog: Kristine is an Art Historian, oil painter, and author who has dedicated her life to the Italian Baroque painter Caravaggio. She is both an academic and creative, teaching Art History as a profession and channeling her passion into creating comic books and authoring novels. She has authored numerous academic articles and has been teaching at the collegiate level for five years. Maia & Kaimani: Maia and Kaimani are 9 and 8 years old, respectively. Both Maia and Kaimani are enthusiastic artists who enjoy making comics, drawing, painting, jewelry making and pretty much flexing their imaginations in any creative capacity. Growing up with empowering and inspiring storytelling such as the films of Hayao Miyazaki and shows like Steven Universe, they are also equally influenced by their comics-making dad, their jewelry-making mom, and Sacramento's thriving comics and art scenes. Megan Risk: Megan works primarily in the traditional mediums: graphite, colored pencils, pressed pastel, etc. Recently she's expanded into the digital art world, mixing it with the traditional mediums. While she started working in portraits and landscapes, she has also explored the realms of horror, supernatural, fantasy, and superhero. Megan sold her first commission when she was 23. Rachel Strum: Local wand-maker Rachel Strum handcrafts fantasy wands. With a background ranging from illustration to stained glass, Rachel’s experience in mixed media has inspired wands unlike any others. Beginning by hand selecting quality supplies, pairing gems individually with wood bases, and then intensively layering mixed media, her wands capture the imagination and inspire a sense of beauty. The delicate balance between beauty and practicality within all her whimsical creations has sprouted from the needs in her life, be it simple toys or giant strawberry pillows. Transforming common materials into playful creations is a labor of love inspired by Rachel’s belief that everyday should come with a touch of magic. Sarah René Kraft: Sarah is a Sacramento-based illustrator, colorist, storyteller, and all around sketchy lady. Experience her work in the illustrated comic world of the Greek mythology-inspired “Blind Follies,” and her upcoming artbook in progress "Lemiscus," among other various arts and projects. Sarah Troedson: Sarah is a composer working in silk, gemstones, pearls, crystals, precious metals, glass, and yarn. Handmade lamp-worked glass beads, silk cord, silver charms, bamboo fiber and baby alpaca yarn are the notes in her music. Colors and textures are the melody and harmony. The "music" she composes is fine jewelry, crochet and woven accessories created with a sense of joy.